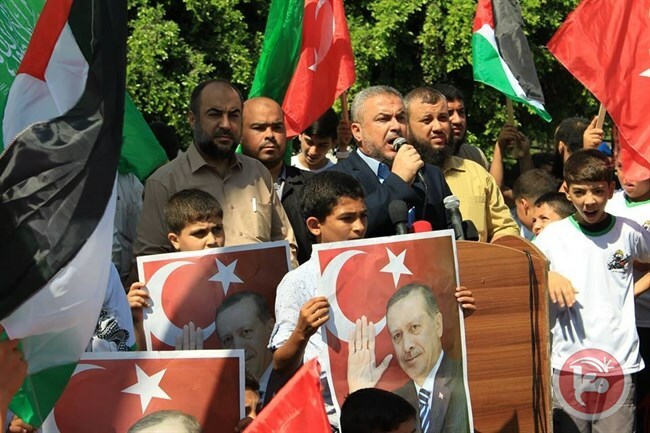 Demonstrations started in the Khan Younis area of the southern Gaza Strip, where participants raised Turkish flags and posters of Turkish President Recep Tayyip Erdogan. In Gaza City, a demonstration was held near al-Tayaran junction, and another in Palestine square. Another demonstration is expected to be held later Saturday afternoon in the northern parts of the besieged coastal enclave. Among the participants of the demonstrations were leaders of the Islamic political movement including Ismail Radwan and Mahir Sabra, as well as youth participants of the Hamas-run summer camps in the area. Radwan continued by praising the Turkish people for “preserving the democratic choice in their country,” drawing parallels between the current Turkish government, and the Hamas government in Gaza which was democratically elected to rule the besieged coastal enclave in 2006. The Gaza Strip has suffered from an Israeli military blockade following Hamas’ victory in general elections and the violent conflict between Fatah and Hamas that ensued, leading to Hamas taking control of the government through an armed struggle. Israeli and Turkish diplomatic relations fell apart after Israeli forces in 2010 attacked the Turkish ship Mavi Marmara — the first Freedom Flotilla, resulting in the deaths of ten Turkish activists attempting to deliver much-needed humanitarian aid to the besieged Gaza Strip. The incident sparked international outcry and severed diplomatic ties between the two countries. The rapprochement deal which normalized diplomatic ties between Israel and Turkey allowed aid to arrive in the Gaza Strip this month via Israel’s Ashdod port as part of the brokered deal. The Turkish government has held long-term support for Hamas, while acting as a vocal critic of the Israeli blockade on Gaza. Erdogan has defended the Hamas movement in the past, stating that the group is a legitimate political party and Israel’s label of Hamas as a “terrorist group” — along with the majority of Palestinian political factions — is aimed at eroding Palestinian democracy. Turkey was also one of the first countries in the world to officially recognize an independent Palestinian state. Meanwhile, Palestinian Foreign Minister Riyad al-Maliki telephoned his Turkish counterpart Mevlut Cavusoglu on behalf of President Mahmoud Abbas and Prime Minister Rami Hamdallah on Saturday, congratulating Turkey on “the triumph of democracy and the defeat of the coup plotters and their failure to convulse the stability of the Turkish republic,” according to a statement released by the Palestinian Authority’s Foreign Ministry.